My Creative Time: Bunny Milk Carton Treat Box! Good morning, that is safe to say, since it is after midnight here! Since my coughing is keeping me up, I decided to stop wasting valuable crafting time & make something! I didn't over do it~ this was something VERY SIMPLE I through together:) For my project today, I used a sizzix die from Stampin up. I have to admit that when I 1st opened my box, I thought stampin up had forgotten to include this die in my order because, for one the box was small! Then I realized I did have it~ it was underneath everything & I couldn't believe how tiny this was!! I immediately grabbed some paper & ran it through my cuttlebug to see how small it really was, then when I put it together, it was actually really cute! It is perfect to use as a favor~ so I decided to put jellybeans (mini ones!) in mine & make enough for my family on Easter! That cute little library clip is also from Stampin up, the ribbon is from PTI, stamp image is from Peachy Keen called "Springtime Minis" & the sentiment is from My Pink Stampers set called "Simply Sweet Occasions"! I hope you enjoy my cute project today & sorry it wasn't a video! Trust me~ you don't want to hear my voice right now! Good morning Emma and what a cute project. Your work is so awsome thank you for sharing. I sure hope you feel better soon. Have a wonderful day. So super cute Emma! Love it. what did you use the die for? Did you use a real milk carton? so cute, would make a perfect favor. I am a little behind but I wanted to congratulate you on becoming a designer for The Pink Stamper. Well deserved!! Everything you make is wonderful! Hope you feel better soon! Emma take care of yourself. I hope you are feeling better. I love your carton. I am going to a SU thing tonight I might have to get one. I love the Peachy Keen Stamp it is so cute! I have the face stamps and love them. Really really cute! It's amazing how creative you can be late at night and sick to boot! Take care and hope you are feeling better soon. So cute Emma ! What a cool gift carton ! SUPER CUTE like ALWAYS!!! Great job Emma, I hope you start feeling 100% again VERY SOON! wow that is nice, hope you feel and get some rest. Super cute! I think you are very talented. Thank you for all the great ideas. This is very nice Emma! I am so excited to be on the Pink Stamper Design Team with you. I just became a follower of your blog. I am looking forward to seeing more of your projects! I love this project....sooooo cute! Get well soon my friend! I also got the milk carton from SU but, haven't used it yet because I've heard it is super tiny. We will be having a half day Regional here in Puerto Rico and, I am thinking of doing something with that die. I am not sure. Hi Emma. Sorry to hear that you're having trouble sleeping. Robitussin DM really helped my husband and I out when we had a cough that wouldn't stop. We'd take it shortly before bedtime. Hope you're feeling better real soon! 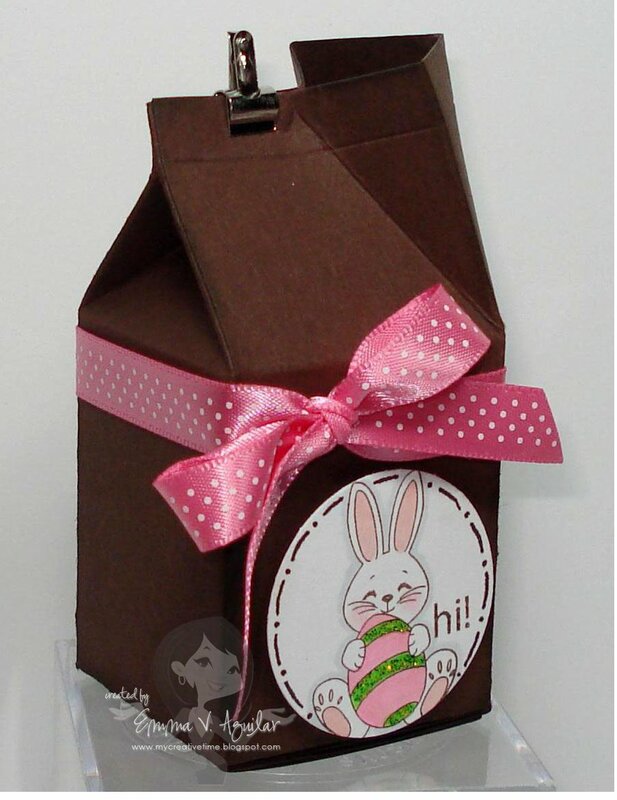 Cute little carton ... love those Peachy Keen stamps, and the MPS ones too! Hi Emma ... just stopping by to say hello. 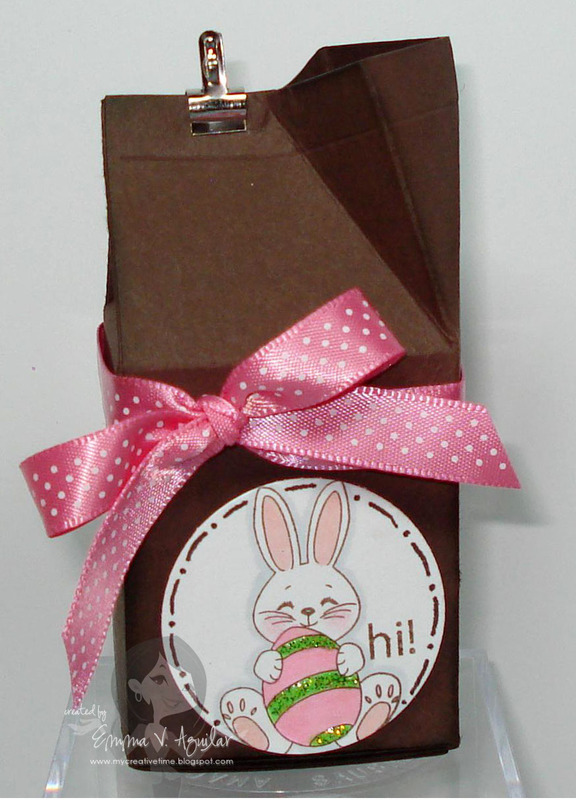 I'm very excited about being on the My Pink Stamper design team with you. I love your blog and videos ... I hope to visit often! Cute project! I can see that Milk carton die in my future! This little carton is sweet as can be Emma! Just like you!! Please get better soon sweetheart. Hi Emma, hope you are feeling a little better and that you are well for Easter. Your milk carton is adorable. Very cute Emma, I hope you are better and ready for easter! Being sick over a holiday is a pain! This is such a cute project! I hope you're feeling better. Thanks for sharing! This is too cute. Great for a party favor. What a cute milk carton. Hope you're feeling better soon.